A book proposing a new and startling solution to the infamous ‘Black Dahlia’ murder, one of the most notorious in American history. To be published in 2017, the 70th anniversary year of the murder. The woman was subsequently identified as 22-year old Elizabeth Short, a budding starlet from small town Massachusetts. Elizabeth had made the descent from Hollywood hopeful to a seedy, hand-to-mouth existence on the fringes of the nightclub scene. Despite hundreds of police hours devoted to the case, and dozens of possible suspects – from celebrities in the movie world such as Orson Welles, to the newspaper tycoon Norman Chandler – the case remains unsolved. Newspapers christened the case the ‘Black Dahlia’ – derived from Elizabeth’s black hair and penchant for wearing black lacey clothes. The murder has become part of Hollywood legend, one of the most elusive and puzzling of noir mysteries. And yet, whilst the writer James Ellroy wrote a splendid fictional treatment of the story in his LA Quartet, not one properly sourced factual account has been written about the case. This book is the first. "Compulsively readable, impeccably researched and heart-rending at times, BLACK DAHLIA RED ROSE deserves a place at the top of any true crime aficionado’s bookshelf. With forensic precision and an admirable eye for detail, Piu Eatwell not only uncovers plausible new insights into the notorious and brutal murder of Elizabeth Short, she unpicks the mores of the time, delves into the motivations of the main players and blasts through the smoky noir clichés surrounding 1940s Los Angeles. " "Piu Eatwell is hot on the trail of one of the 20th Century’s most famous cold cases — the Black Dahlia murder – and she takes us along for the ride … back to Los Angeles in the winter of 1947, back to the wealth of evidence assembled by the cops, by the tabloids and news dailies, by a 1949 grand jury. The ride is well worth taking, especially when she hones in on a plausible and previously neglected suspect in the case." "a convincing case for the Black Dahlia killer’s identity." "Eatwell’s book is a vivid portrait of late 1940s Los Angeles, where gangsters, pimps and corrupt cops mixed in the same circles — and exploited vulnerable women….Her book reads like a thriller, but it never loses sight of the real woman whose life was so savagely extinguished ." " Written in a narrative style that evokes the smoky noir of LA in the 1940s, it’s a gripping tale featuring a host of colourful characters – from hard-boiled cops and intrepid journalists to wannabe actresses and Hollywood gangsters.It was hard to put down. When I wasn’t reading it, I found myself thinking about the Dahlia and her untimely death.But does Eatwell solve the case, as she claims?After three years of painstaking research, she puts forward a compelling and convincing conclusion. It’s a must-read. " "a meticulously researched work that is delivered with all the punch, pace and suspense of the finest noir thrillers….Subtitled “America’s most notorious crime solved for the first time”, the book’s cast of characters is as lurid as might be found in any Raymond Chandler novel, as the narrative embraces crusading journalists, sociopathic ex-soldiers, ambitious lawyers and politicians, and a host of shadowy figures from Los Angeles’s criminal underworld. Brilliant at evoking the grimy, amoral excesses of Los Angeles and Hollywood, Eatwell never forgets the tragic figure at the heart of her story, while emphasising the callousness of the post-second World War era in which she was so brutally murdered. " "A magnificent, meticulous and startling re-examination of a crime that haunts the world’s imagination." 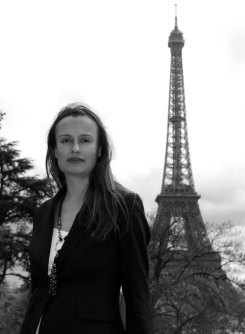 "Eatwell pursues her suspect to the nightmarish end, uncovering corruption of every kind, and offers a convincing solution. Her book could also be read as a critique of an era in which emotional devastation and exploitation were inevitable by-products of a system capitalizing on desire. " "Black Dahlia, Red Rose by Piu Eatwell provides fresh evidence that we can never get enough of our favorite pin-up corpse. . . . [A] juicy page turner…capturing both the allure and the perils of the dream factory that promised riches and fame to star-struck young women from tired little towns all over war-weary America and who, even today, find themselves at the mercy of predatory men." "thoroughly researched and expertly told." "a very detailed journalistic investigation of one of America’s most shocking crimes… Though racked on non-fiction shelves, it is written in almost a novel from/style… The level of research by novelist and TV producer Eatwell is extraordinary with its detailed notes, glossaries, index and footnotes… Black Dahlia, Red Rose also casts a long shadow, for it remains in the mind long after the book is put down as it makes one think about our lives, and the lives of others. " "Probably the final book on the case and the best, as the author’s exemplary reserach collects all available data and allow the reader to make his mind up." "...thorough research, which includes evidence never revealed before, or even known to have existed. Readable and convincing." "a compelling hypothesis that one of the original suspects was indeed the killer." " a thoroughly researched look at the crime and subsequent investigation conducted by the LAPD. Eatwell successfully paints a portrait of the city and its police department, signifying that the cover-up and corruption involved in this case (as well as throughout the department) was a product of the time and not reflective of today's practices." 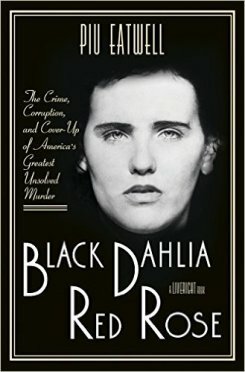 Documentary rights in Piu Eatwell’s Black Dahlia, Red Rose, which provides a new and startling solution to the infamous ‘Black Dahlia’ murder of 1947, have been optioned by Peacock Productions at NBC Universal. The book is published in October in the US by Norton and in the UK by Hodder. Coronet have bought UK rights in Piu Eatwell’s re-examination of The Black Dahlia case Black Dahlia, Red Rose. North American rights have been sold to Norton.